The University of Nebraska-Lincoln (UNL) has introduced an online manual to assist producers in evaluating the economics of storing ethanol coproducts for extended periods of time for inclusion in cattle rations. The resource addresses potential opportunities to store coproducts and describes a spreadsheet to analyze associated costs. Click here to access the manual. Click here. compiled by Linda Robbins, assistant editor, Angus Productions Inc.
Gillis Agricultural Systems Inc. has launched a new composter, the EcoDrum Composter, now available in the Midwest. The EcoDrum is a year-round controlled system, processing 100% of barn mortalities, as well as manure and bedding, on site within a short time. The U.S. Department of Agriculture (USDA) Natural Resources Conservation Service (NRCS) has made the composter eligible for grant money as part of its Environmental Quality Incentives Program (EQIP) in some states. Although the vessel was developed with the swine industry in mind, the composter can be used by any type of animal production system as long as the maximum daily capacity is respected. The company suggests farm owners and managers decide whether the EcoDrum suits his or her operation. They may need special permits for any of the six models of the composter. For more information visit www.gillisag.com. 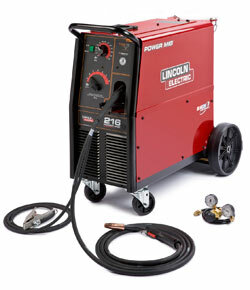 Lincoln Electric has added the Power Mig® 216 wire feeder/welder line to provide metal job shop fabrication, maintenance and repair, autobody, farm and light industrial production industries with top welding performance for both metal inert gas (MIG) and flux-cored welding on mild steel, stainless steel and aluminum. The 216 arrives spool-gun ready, allowing users to switch to aluminum wire welding. With a wide amperage range of 30 to 250 amps, the 216 provides more output and better efficiency than comparable machines. The unit also features the company's new Coil Claw™ cable management system and a top-mounted gun expendable parts tray for convenient and safe storage of the gun, cables and related pieces. Call 1-888-355-3213 or visit www.lincolnelectric.com to obtain Bulletin E7.52. Agco Parts and Service announces an electronic way for farmers to order the technical publications they need, including parts catalogs, operator manuals and repair manuals, and promises shipment in hard-copy paper format within 72 hours. The company has created new web sites specifically dedicated to this new ordering and delivery process. The company's "Dealer Locator" is featured prominently on the various brand web sites to give farmers the option of ordering their technical materials through a local dealer. In addition to current brands and models, the company says the new system will use the speed of the electronic age to put in the hands of equipment owners printed copies of original publications of the company's heritage brands, including Agcostar, Allis-Chalmers, Farmhand, Fieldstar, Gleaner, Glencoe, Hesston, Loral, Massey Harris, New Idea, Rogator-Terragator, Spracoupe, Sunflower, Tye, White Planters, White and Willmar - many which have been out of print for decades. Additionally, the company is in the process of bringing additional heritage brands online by the second quarter of 2010. The system can be accessed through www.agcocorp.com and on the specific brand web sites such as Massey Ferguson, Challenger, Fendt and Valtra under the Parts & Service tabs or through www.agcopubs.com. Trimble has introduced the AgGPS® EZ-Office® 2010 software suite of products designed to help farmers map and manage field data by providing field-to-office information management. EZ-View, EZ-Office and EZ-Office Pro focus on data management in the office, while EZ-Office Mobile software runs on the Trimble Nomad™ or Juno™ handheld Global Positioning System (GPS) computers in the field. The Nomad features a high-resolution sunlight-readable display, a 15-hour Lithium Ion (li-Ion) battery that can work all day without a recharge, an integrated GPS and a color digital camera. The compact Juno SB is lightweight and compact and features a 3-megapixel camera, a high-sensitivity GPS receiver and a long-life battery. 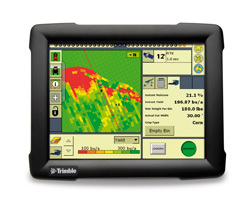 For more information call 1-800-865-7438 or visit www.trimble.com/agriculture. Dickson Co. now offers a data logger selection guide online to help users find the best-match technology for monitoring temperature, humidity, pressure or electronic signal events. Multiple selection factors are provided, including instrument displays, remote probe availability, alarm options, wireless/Ethernet/battery-operated or outlet-powered, operating ranges and cost. Users are able to drill down and mix and match various features until they identify the range of instruments that match their specifications. The selection guide can be accessed at www.dicksondata.com/article/article_61.php. The company's customer services can be accessed at dicksoncsr@dicksondata.com or by calling 1-800-757-3747. 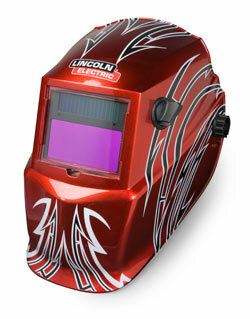 Lincoln Electric has introduced its Viking™ auto-darkening welding helmets, designed to handle applications in almost any industry, including metal fabrication, maintenance and repair, auto body work, farm and small shop. The helmet weighs less than 18.5 ounces and features a sizable 96 x 47 mm viewing area, external continuously variable control for shades (shades 9-13), a grind mode, and variable sensitivity and variable delay, allowing users to dial in their preference for each application. The helmet also features headgear with a soft, absorbent sweatband and magnifying lens capability for experienced welders with less-than-perfect vision. Visit your local welding distributor or www.lincolnelectric.com to obtain Bulletin 12.207.1 for more information.